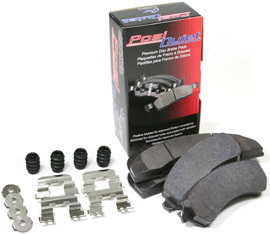 Replace your worn out brake pads on the BMW X6 with the Centric Posi Quiet Brake Pads. Note: The Centric Posi Quiet Brake Pads are sold in pairs. The Centric Posi Quiet Brake Pads are the perfect replacements for the BMW X6. It is really important to replace worn out brake pads with high quality replacement pads. The Centric Posi Quiet Brake Pads for BMW X6 are the highest quality brake pads available for your car. These brake pads are manufactured using the exact same positive molding process as OEM suppliers. You will see an increase in brake pad friction and an improvement in braking consistency after installing the Centric Posi Quiet Brake Pads for BMW X6. All the necessary hardware is included for an easy installation, and with Centric's specially engineered hardware, all brake noises and vibrations are eliminated. Note: The Centric Brake Pads for BMW X6 are sold in pairs. Access to a lift or jacks and jack stands required for installation.